A few steps over the road from WitsEnd and you are walking on the golden sands of Ligar Bay which is a beautful, safe, sandy beach. No having to drive to the beach, you are already there. If you forget the sunlotion it is only steps back to your welcoming bach.Ligar Bay is approximately 10 minutes drive from Takaka, a short drive to great walking tracks, the northern gateway of the Abel Tasman National Park and local attractions You can check out eateries in nearby Pohara or further afield if you want to combine dining with exploring Golden Bay. You can launch your boat at nearby Tarakohe Harbour or at Tata Beach or you could take a leisurely paddle around the Bay on WitsEnd's kayaks, maybe out to the Tata Islands to spot the seals or potter around in the Estuary at high tide. WitsEnd is furnished for comfort and that special 'holiday feel'. To enhance your stay, there are also mountain bikes available for exploring nearby areas and board and card games to bring out the competitive holiday spirit. Dine out on the balcony overlooking the water or out the back to keep the cook company at the BBQ. You will be drawn by the ever changing sea views and the relaxing atmosphere of WitsEnd. Please note. Summer 2018/2019 bookings are unable to be confirmed until after August. Cleaning fee does not cover BBQ. Guests required to leave BBQ in a cleaned state. Bed linen, bath mats, tea towels supplied, guests must bring own bath/beach towels. Downstairs bedroom does not have internal stair access, suits adults or older teens only. Maximum number of guests is six, no camping, pets or smoking on site. Our family have enjoyed many happy times at Ligar Bay and continue to do so. We enjoy providing responsible people the opportunity to experience this beautiful part of New Zealand. Well set up for a leisurely and comfortable stay in a clean and cosy bach. 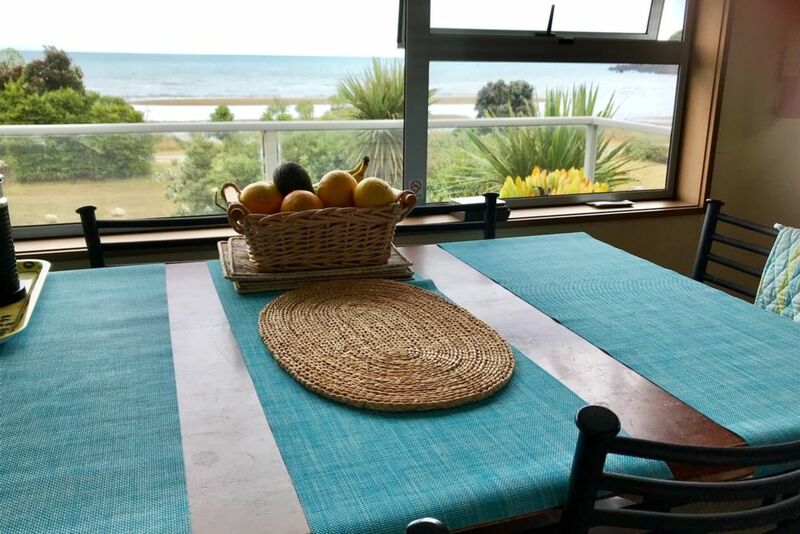 While it is not a large house, its well cared for and the beach across the road is a great playground especially at low tide when holiday makers often play beach cricket or other games on the beach. Ideal for children. All bed linen, mattress and pillow protectors provided, bedding, small hand towels and tea towels. Note: Guests need to bring their own bath/beach towels. Remove TOP part of rotor (only used for adding fabric conditioner). Put powder in bottom of rotor, replace the TOP part back on rotor. Choose program. Don’t overload or it will shake & rattle. Garage height is low. Not suited for high vehicles. Driveway best approached from a left angle to avoid catching towbar or undercarriage. Ok to park on grass or the berm in front of property. Instructions for using oven, microwave, radio and television will be provided at the house. Most are in a plastic sleeve hanging on the inside of the pantry door. Everything you need to cook and eat. Please replace things back where they were stored. Instructions will be available at the house. Instructions at the house. Please do not change settings. We had a great time in this traditional Kiwi bach - a high standard of everything! A comfortable place to stay. Handy to everything with a lovely outlook. its always nice to share WitsEnd with good people. Thank you for your kind comments. WitsEnd is the perfect property for a family stay. The location at Ligar Bay is breathtaking with a wonderful beach for swimming & kayaking. The bach is always spotless & the beds beautifully made and the kitchen is well equipped. We continue to return to WitsEnd as it is a family favourite. Right across from a beautiful safe swimming beach. Very clean and well organised house. We loved our stay. House had everything we needed for a great summer holiday. Was so handy being able to hop across the road to swim and use the kayaks. Loved Waking up to the beautiful views! Close to lots of wonderful places to explore. Great communication too. Would love to come back again one day. Many thanks. You are welcome. It was a pleasure to have your family stay. So glad you enjoyed your holiday in this special part of NZ. We would welcome you back with pleasure. What an amazing house in the perfect location!